Preheat oven to 350°F. 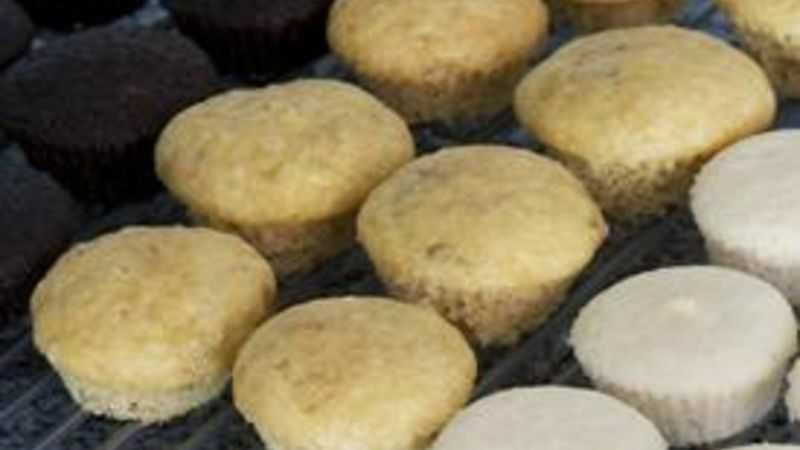 Place cupcake liners in mini muffin pan. Mix cupcake ingredients together, just until moistened. Pour into prepared pan/liners. Allow to fully cool. Remove liners before using in cupcake fondue. Mini Banana Cupcakes taste great on their own or with some coffee and tea, but do you know what's an even better way to serve your mini cupcakes? How about with a sweet dessert fondue! Dessert fondue? That's right, we're talking about the cutest dessert idea in ages upon ages! I wish I came up with it—here’s a big shout out to the lovely and talented Amanda Krueger at Bake it Pretty for coming up with this fabulous idea. Read about her cupcake fondue concept. After seeing Amanda’s recipe, I tried the cupcake fondue and loved it. The cupcakes, the dessert bling (you know how I love bling! ), the dipping…it was all simple and fun! A cupcake fondue is about the easiest thing ever, regardless of the dipping medium chosen. Start with fully cooled, unfrosted mini banana cupcakes or cupcakes made from any flavor of Betty Crocker™ Super Moist™ cake mix. A safe estimate is 3 to 4 cupcakes for each person dipping. I made three varieties—chocolate, white, and banana. And I used paper liners. (In my opinion, peeling the paper liners off is no big deal compared to washing my muffin tin several times.) Then, put your toppings out in little bowls or teacups—the cuter the better. I used several varieties of sprinkles, sugar pearls, candy hearts, and chopped nuts, but let your imagination and your burgeoning cupboards be your guide! Next prepare the drizzle, melt your melts, and you’re off to the races. Amanda used powdered sugar drizzle. You’ll need about three cups of drizzle for the dipping, depending on the number of dippers. I added white and chocolate candy melts (my supermarket carries Candiquik). I love how candy melt sets up and how firmly it holds the sprinkles and other sugary goodness. (So I can pack more on.) If you have leftover colored candy melts from other projects, this would be a perfect use for them! The extra nice thing about this fondue is that you don’t really need a fondue pot to pull it off. If you have a cute one, that’s great, but the drizzle and the candy melts don’t need to be heated—the drizzle will stay liquid, and the candy melt does best in a ceramic vessel that can go back in the microwave if it starts to get too stiff. If you don’t have fondue forks on hand, a wooden skewer will also work—and they’re super easy to tint if you’re feeling fancy. Just soak the skewers in water tinted with a little food coloring (I used about 10 drops). Then, drain the skewers and allow them to dry fully. And there you have it—a cute, festively colored dipping utensil. Happy fonduing!